Background: Owing to rapid development of hardware components and reduction in prices, Unmanned Ariel Vehicles (UAVs) are becoming ubiquitous including application to airborne ad-hoc communication relay stations. Quadcopters are one class of UAVs, which have particularity seen rapid growth due to their versatility. Since quadcopters are inherently unstable and hard to stabilize by human operator, they need automated attitude stabilization. However, altitude stabilization around desired height is often overlooked, while it has an important role in optimal location for airborne communication relay. Objective: The paper addresses the issue by developing controllers for UAV hovering. The proposed approach can then be extended to arbitrary height (possibly with different sensor setup). 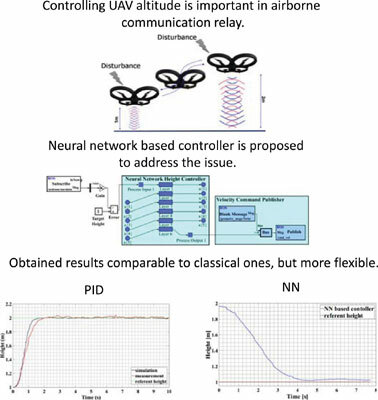 Method: For the development of control schemes, two approaches were used: PID and Neural network (NN) based one. For the development of NN (i.e. learning phase) Gazebo simulation environment was used essentially modeling the human driver. Developed approaches were tested both in simulation and in real-world scenario on AR.Drone 1.0 and AR.Drone 2.0 UAVs. Results: Obtained indoor results demonstrated PID accuracy of 1 cm with overshoot of 2.7% and settling time of 3.75 s, while NN demonstrated 2.1 cm, 1%, and 8.4 s, respectively. Outdoor testing was also performed with similar result trends. Conclusion: Both developed controllers demonstrated good results (indoor and outdoor) and could be used in real world scenario, but NN due to its favorable characteristics (i.e. human driver modelling) and straightforward development phase (as compared to PID which involves lot of trial-and-error) is preferred. Altitude control, communication relay, neural network, PID, stabilization, UAV, simulation.